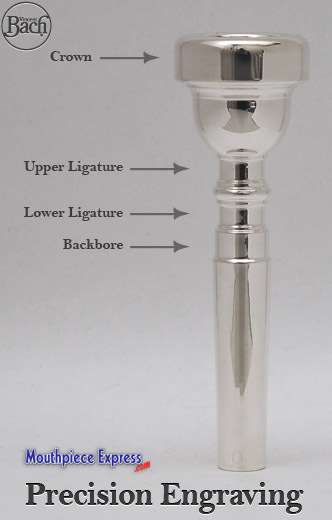 Initials on the Crown of the mouthpiece appear 4 times with your choice of embellishment. Initials on the Ligatures or Backbore appear 2 times with your choice of embellishment. Some embellishments may not be available because of size constraints. Phrases (names, dates, or messages) are allowed a generous 50 characters on the Crown and 25 characters on the Ligatures and Backbore. Click Here for the example gallery. Please Note: All engraved mouthpieces are NON-CANCELABLE and NON-RETURNABLE. *If your mouthpiece is not in stock, please allow an additional 3-6 weeks once we have received your mouthpiece from our supplier. We reserve the right to reject any engraving requests we consider to be inappropriate or offensive. Thank you.